Get ready to sail one of the most exciting ships on the seas! 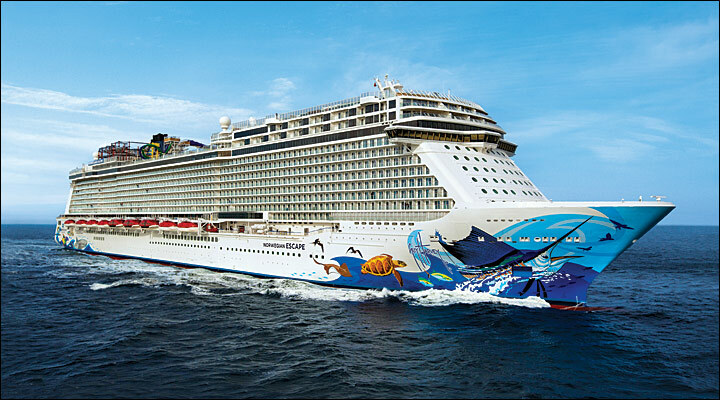 Norwegian Escape is ready to whisk you away. Indulging in every whim is what unforgettable vacations are made of. Get ready to chase sunsets on The Waterfront. Explore a world of exotic flavors with two new restaurants from Iron Chef Jose Garces. Try unique specialty cocktails, hand-crafted by Bar Lab. Or be dazzled by Broadway hits. Discover a new world of Freestyle Cruising on Norwegian Escape. From top to bottom and from bow to stern, Norwegian Escape has enough onboard activities to fill every minute of your cruise. Think you’re brave? Splash around at Aqua Park with Free Fall - the fastest waterslides at sea. Or visit the multi-level Sports Complex and walk The Plank, which extends 8 feet over the side of the ship. Wanna get lucky? Bet it all at the award-winning Casinos at Sea. With so much excitement, they’ll always keep you coming back for more. Dine like nowhere else at sea with all of the freedom and flexibility of Freestyle Dining. Flavors come alive at Iron Chef Jose Garces’ Bayamo, where seafood meets a Latin twist. Travel somewhere new with familiar favorites and unique additions from around the globe at Food Republic by the Pubbelly Restaurant Group. Or take a bite out of paradise with signature items like the Cheeseburger in Paradise in Jimmy Buffett's Margaritaville. Whatever you’re in the mood for, there is something for everyone. Pull up a stool at The Cellars, a Michael Mondavi Family Wine Bar. Let your hair down in the District Brew House, offering more than 50 different bottled beers and 24 draft beers on tap. Sip on a signature margarita at Jimmy Buffett's the 5 O'Clock Somewhere Bar. Or reminisce about the good 'ol days at Miami's oldest bar, Tobacco Road. Grab your glass, make some new friends, and let the good times roll! These staterooms include two lower beds that convert to a queen-size bed and some staterooms have up to two additional Pullman beds to accommodate up to two guests. There are also some connecting staterooms available. 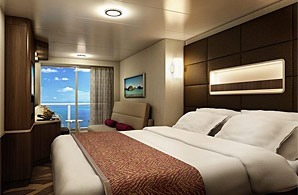 Oceanview staterooms feature a large picture window and two lower beds that convert to a queen-size bed. Family Oceanview Staterooms are perfect for the whole gang. They include two lower beds that convert to a queen-size bed and additional bedding that can accommodate up to three guests. Take in the amazing views from your balcony stateroom that includes two lower beds that convert to a queen-size bed and additional bedding that can accommodate up to two guests. Family Balconies are ideal for the whole family, these staterooms are conveniently located near the kids’ area and include two lower beds that convert to a queen-size bed, and additional bedding to accommodate up to two guests. 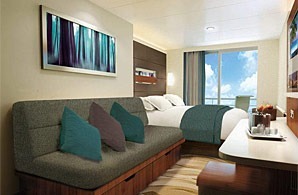 There are also some connecting staterooms available. 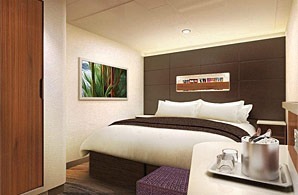 Mini-Suites are perfect for those seeking a little more room than the standard Balcony Stateroom. Featuring a king- or queen-size bed, and additional bedding to accommodate up to two guests, Mini-Suites offer comfort and amazing views. Perfect if you want to bring the kids, Family Mini-Suites are also available and feature a king-size bed, additional bedding to accommodate one or two guests, a bathtub, and are conveniently located near the kids’ area. 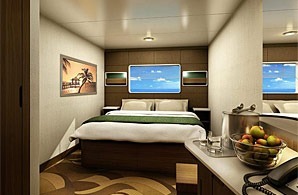 There are also some connecting staterooms available.